Winning athlete helping fallen athlete. The general rules of the Games specify that the Olympic Games prizes consist of both Olympic medals and certificates. Each medal is accompanied by a certificate. A certificate is also awarded to the winning team in team events. The Organizing Committee can, on the request of an international federation, award a certificate of merit to a competitor whose performance is outstanding, but who fails to win a prize. 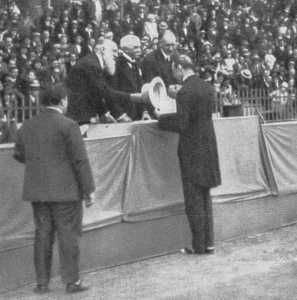 All participants in the Games receive a commemorative medal. 1. For the wining team, a team certificate, and for each team member, a gold medal and a certificate. 2. For the team coming second, a team certificate and for each team member, a silver medal and a certificate. 3. For the team coming third, a team certificate and for each team member, a bronze medal and a certificate. In team events, all those having effectively participated in the event have a right to a medal and certificate corresponding to prize won by the team. 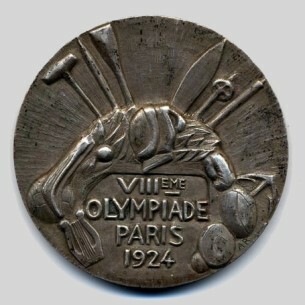 Moreover, at its session of 6th June 1921, in Lausanne, the international Olympic Committee decided, at the proposal from M. le Comte de Baillet-Latour, that an international competition be inaugurated by the French Olympic Committee and that the winning medal be put forward for the agreement of the International Olympic Committee, to become the definitive prize for future Olympic Games. Only the commemorative medal would be left to the choice of the national committees, so changing every four years. Limited competition - So the French Olympic Committee was still responsible for organizing a competition restricted to young French artists of the Committee's choosing. A list of six names were given to the Committee by M. Olivier Sainsere, Président du Jury de Peinture (President of the Board of Painting Judges), a reputed lover of art, and M. Georges Salles of the Direction des Beaux-Arts (Director of Fine Art). 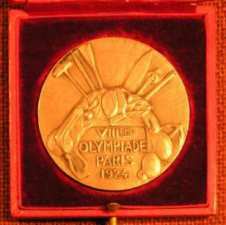 They were Messrs Bénard, Fraisse, Morlon, Poisson, Rivaud, and Roques, all holders of gold medals or of the Prix de Rome (French government art scholarships) and all, moreover, practitioners of sport. They were informed in a letter dated 23 October 1922 of the rules of the competition. They had to take their work, on 1st February 1923, executed in plaster or in the definitive material, to the headquarters of the French Olympic Committee, to submit them to examination by the Commission des Arts. As the uncertainty of the reward, the fear of losing, and the time and effort involved made most of the artists taking part only devote their spare time to it, the members of the Commission decided that each of the candidates should receive 3,000 francs compensation for their work and the best judged design would achieve a 15,000 franc prize, with its creator commissioned to execute designs for the obverse and reverse faces of the medal. The medal that appeared the most original was that of M. Rivaud. It was accepted by the Commission des Arts at the third round of judging. 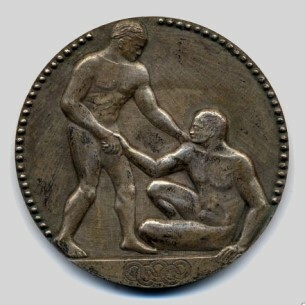 During the same session, the Commission decided to entrust the commemorative medal to M. Roques; but, because of the failure of this artist, the completion of his work was entrusted to M Raoul Benard, who had previously engraved the Winter Sports medal. The medals were struck at the Paris mint. There were 912 prize medals and 9,500 commemorative medals delivered.